Koichi Yamaguchi checking frame alignment. Picture taken in the early stages of Yamaguchi Framebuilding era. Designed and Built Team Time Trial Frame for John Stenner (3rd in FinalStage of Tour de Trump). Baltic Sea Stage Race Mechanic at Finland-U.S.S.R.
World Championship Mechanic at Lyon France . Jr. World Championship Mechanic at Moscow U.S.S.R. 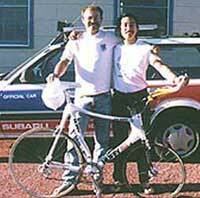 Designed, built & partially sponsored ParaOlympic Team of Al Whaley and Pam Fernandes tandem Gold and World Record 1 kilometer Time Trial. Silver in Sprint.